Passover is a bread baker’s nightmare. Giving up my buckets of different flours for a week-plus is like torture to me. The only consolations are the traditional foods I love to savor this time of year. Absolutely nothing beats a great big dollop of chopped liver on that first piece of matzah fresh from the package. And my family’s recipe for chocolate chip mandelbrot is destined to be passed down to my kids and future grandkids. Then there are the new traditions that I have created in my home, Passover recipes that are free of any sort of flour or flour substitute. Yes, ground almonds are a nice change of pace and are featured as a stabilizer in many chometz-free recipes, but they come with a hefty price tag. Usually, my thinking is that if I am going to pay top dollar for nuts, they’d better be flavorful—like cashews, pecans or the king of them all, the pistachio. Pistachio paste is a gourmet product that is as flavorful and decadent as it is expensive—until you learn how to make it at home. Still something of a luxury, each year I wait for Passover to produce a batch of the paste. Growing up near Boston, I was always smitten with the bright green Italian macaroons sold at bakeries in the city’s North End. It it the remembered allure of those cookies that inspired me to run homemade pistachio paste through meringues. The result is a delectable cookie cousin to those Italian macaroons, without too much extra effort. Making these cookies giant-sized evokes the the stack of extra-large meringues and elegant meringues that decorate the countertops of many Parisian bakeries. And the addition of the specialty pistachio paste helps me to forget all about the many flours I so love and ordinarily long for. 1 tablespoon finely ground pistachios for garnish, optional. Preheat oven to 300°. Prepare your mixing bowl and whisk attachment by rubbing a halved lemon over the entire surface and then wiping clean. Pour sugar into a medium bowl and set aside. Prepare whichever add-in you are using, and have ready a silicon spatula and two small spoons. Prepare trays by covering with parchment paper and setting aside. Crack cold eggs and carefully separate the white from the yolk, placing the egg whites directly into your mixing bowl. If any bits of yolk get into your egg whites, scoop them out with a piece of shell. Whip egg whites on the highest speed until foamy (like shaving cream). At this point, add the salt and vinegar. Whip again on the highest speed while adding sugar, one tablespoon at a time, letting the granules incorporate into the mixture fully before adding the next. Continue like this, slowly, until all the sugar has been absorbed into the egg whites. Once all the sugar has been added, continue to beat for 5 to 7 minutes. When done, the mixture should have a stiff peak that won’t fall out of the bowl even if turned upside down, and should not feel gritty when rubbed between your fingers. Using a little bit of merengue as adhesive, tack down the sheets of parchment paper to your baking tray. For pistachio meringues: Using a silicon spatula, swirl the pistachio paste through the merengue in just 2-3 gentle folds. Any more than this will deflate the meringue. 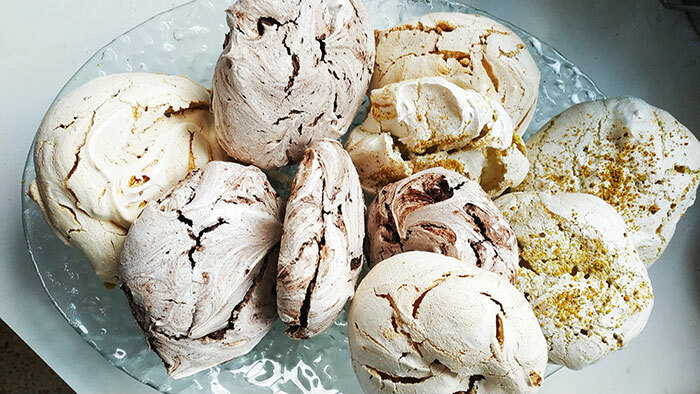 For chocolate meringues: Sift cocoa powder over the merengue mixture, and gently sprinkle in chocolate chips. Swirl the cocoa powder and chocolate chips through the mixture with just 2-3 gentle folds. Any more than this will deflate the merengue. Spoon mixture onto the baking tray in heaping half-cup-sized portions and gently shape with two spoons. Bake for 30 minutes, then let the meringues sit in the turned-off oven with the door closed and light off for an additional 1 hour. When they’re ready, meringues will be easy to remove from the tray with a firm crunchy bottom and outside, and a gooey inside. Let cool before storing in an airtight container at room temperature for 3 to 5 days. If there is one recipe that will get me to individually peels skins off of nuts, this is the one. 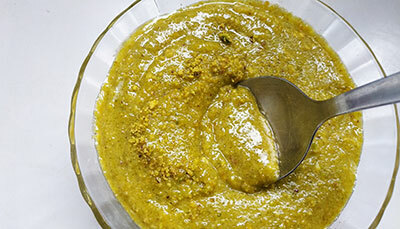 Pistachio paste is so unreplicable in its divine taste, that the prospect of spreading it on my morning toast, or running it through homemade vanilla ice cream, is more than enough to make up for the tiny bit of elbow grease it takes to create a batch. Make ice water in a medium bowl by adding a couple handfuls of ice cubes to a few cups of water. Bring a small pot of water to boil, then dump the pistachios into the water to boil for 1 minute. Strain the pistachios using a fine mesh strainer, then submerge them in the ice water. Let sit for 5 minutes to cool completely. Strain the pistachios, then place them in an empty bowl. Grab a handful of nuts at a time and forcefully rub them together between your palms to loosen the nuts’ skins. Next to your sink or a small bowl of water so that you can rinse or dip your fingers as needed, peel the skins off the pistachio nuts. The skins should come off fairly easily. Place the peeled pistachios directly in the food processor. Once the nuts are all skinned and in the food processor, add sugar and pulse until the nuts are coarsely ground. Add the oil and extract and continue to pulse, slowly adding the water 1 tablespoon at a time. The end result will be a wet, spreadable texture. Thank you! I will definitely try both versions. Will this recipe tolerate piping the meringue onto a baking sheet instead of dropping it from a spoon?